Reverse time calculator tells how often something happens per unit of time, based on the same thing expressed in a different unit of time. 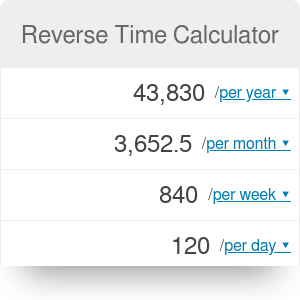 The reverse time calculator answers a simple question: if something occurs X times per some unit of time, how many times will it happen per different unit? We are using current frequency as a predictor for what happens in the future. In other words, how often this thing occurs is a constant value. Example: I know that Omni Calculator's website received 45000 visits from search engines this week. A week is a perfect time unit to measure for us, since the traffic strongly follows a weekly pattern (weekends are quiet, working days are when people come in larger numbers). While monthly traffic is less interesting for me, as a month is a less uniform unit (28-31 days, different number of weekend days, etc. ), I often want to know the number: "how many visits do we have per month"? It comes up in conversations, it's a base unit of time in many fields for reasons unknown to me (why are salaries usually paid per month? why are services billed monthly? This calculator lets me enter 45000 in the "/week" field and I immediately know that over the course of an average month, it would mean 195665 visits. BTW, before I made this calculator, I would simply use a regular calculator like this: 45000 * 30.5 / 7, which produces 196071, which is close enough for my needs. It completely ignores the growth factor. Us the exponential growth prediction tool to see what some value would be if it grows by a certain percentage in a given period of time. The compound interest calculator does a similar thing, but it measures something per amount of time, not per unit of time. And finally, the rule of 72 calculator simply tells you how much time something needs to double if it follows an exponential growth pattern. Reverse Time Calculator can be embedded on your website to enrich the content you wrote and make it easier for your visitors to understand your message.